Sold Puts are one of the more conservative trades an investor can make yet these trades can still make returns that beat the broad market, usually when a stock is stagnant. This kind of trade should not be considered unless the underlying stock (or ETF) is one that the investor is willing to own. This strategy is known by a number of names, Sold Put, Short Put, Naked Put, Cash-Secured Put. It has a lot of names, all of those refer to the same basic idea: selling a put. These trades are easy to place, simply sell a put, collecting a credit in exchange for an agreement to potentially buy the stock at the strike price of your put, if the stock falls. The ideal scenario is that the stock rises, or stays flat, and your option expires, leaving you with the cash you got for selling it. InvestorsObserver only selects puts to sell where the breakeven point on the trade is below the current price of the stock. For this reason, your cost basis will be lower than an investor who just bought the same stock at the same time. Your break-even price is the strike price of the put you sold, less the credit you received for selling it. As long as you have the sold put in your account you will need to keep cash on hand to cover the purchase of the stock. The profit from a sold put is limited to your initial credit while the downside potential runs from your cost basis down to zero (although in most cases, that is pretty unlikely. That is true of any stock purchase though. In reality, selling a put gives you a chance to own the stock if it pulls back, and then lets you buy it at a discount from there. In return for that safety, you don’t get the same reward for a stock that makes a big move higher, so this kind of trade is not a great idea for stocks with high upsides. Instead, this is a good strategy for stable stocks that you wouldn’t mind owning at a lower price. There are only two outcomes for sold put trade. If the stock is higher than your sold put’s strike price at expiration, it will expire and you will keep your credit. 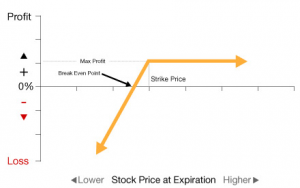 If the stock is below the sold put’s strike price at expiration, then the put will be assigned. Since you sold the put, you will have 100 shares of the stock per contract, put to you. This means you buy the shares at the strike price of your put, giving you a cost basis of the strike price, less your initial credit. At this point, you can either sell the shares, hold the shares, or sell a call against your shares, turning the position into a covered call. If, prior to expiration, you decide that you want to close the position, you can always buy back the put you sold. To search for sold put using a screener use the Trade Idea Generator. Up next: What are Diagonal Spread Trades?